An Albanian describes plant uses. Traditional communities living in isolated, rural areas with little money or infrastructure tend to have one thing in common: Resilience rooted in intricate knowledge of their natural environment, especially plants. This knowledge may be relevant to some of the biggest problems in plant science, including climate change, conservation biology, food security and human health, says Cassandra Quave, an ethnobotanist at Emory University. Quave led an ethnobotanical study centered on a remote corner of the Balkans that was published in the journal Nature Plants. Her co-author is Andrea Pieroni from the University of Gastronomic Sciences in Pollenzo, Italy. Emory’s Center for the Study of Human Health funded the study, with additional support from the University of Gastronomic Sciences. The study compared how two different cultures used plants in the Gora region of northwestern Albania, near the border with Kosovo. The researchers focused on a rural district of Gora that is one of the most economically disadvantaged in Albania. 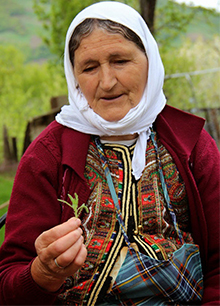 The two cultures in the study, Albanians and the Gorani ethnic minority, were both Muslim and subsisted primarily on small-scale agricultural, especially potato farming. The area is mountainous and many “roads” are unpaved, rocky paths. Some communities can be cut off completely from the outside world by heavy snows during the long winters.